My Friday mornings are usually spent sleeping in, but last week I made an exception. International Students Overcoming War (ISOW) held a symposium — Responding to the Human Realities of Conflict — with the department of Global Studies and Religion & Culture. ISOW describe themselves as a unique student-led humanitarian initiative that brings students, faculty and staff together to realize Laurier’s commitment to inspiring lives of leadership and purpose. Their mission is to promote student engagement through the study of the human realities of international conflict as well as to provide scholarships to international students affected by conflict. I was aware of ISOW’s work due a class I took last semester with Laurier professor Gavin Brockett, who often spoke of the work that ISOW did. The group also houses a few of the scholars who I am lucky to call my friends. I was keen to learn a little more about what ISOW does. The symposium started with a welcome by Richard Nemesvari, the Dean of Arts. He provided an anecdote on his background; his grandfather fled to Germany following World War Two to avoid Soviet aggression. 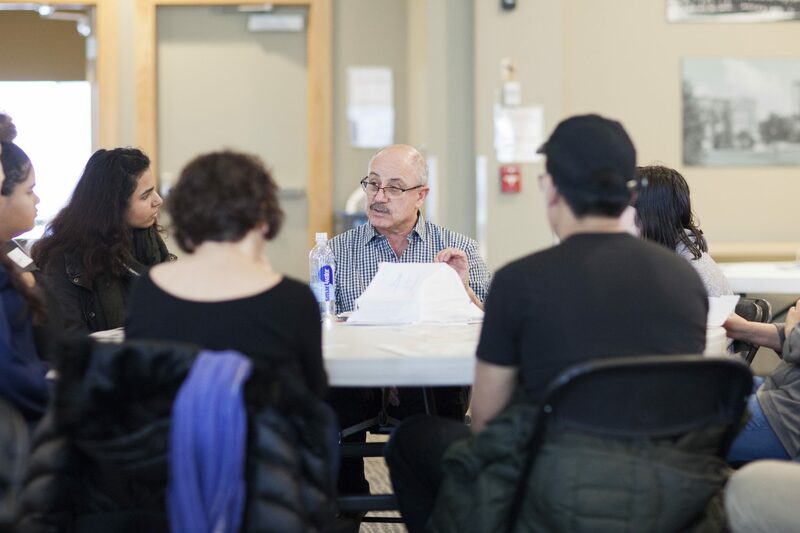 Despite this close connection that Nemesvari has to the refugee experience, he explained that growing up it was simply a story. “I never really understand what they had gone through,” Nemesvari said. This anecdote really highlighted the purpose of the symposium, which was to figure out how to turn these stories into productivity, or even just to truly understand the refugee experience. “Until we can truly understand it,” Nemesvari said. “It’s going to be difficult for us to do anything about it”. Brockett spoke next, introducing the symposium by highlighting its importance in fulfilling ISOW’s mission. “How should we, here in Canada at a university, respond to what we have learned about the everyday experiences of people whose realities seem so far removed from our own?” Brockett asked. Brockett highlighted the difficulty in answering this question. There is a danger of offending or upsetting the individuals who we strive to help, but at the same time, we feel like we must act in one way or another. ISOW provides a solution to this difficult problem, despite its acknowledgement of the bumpy road ahead. “One of the most difficult challenges that we face is how to address, or whether to undress the pain and suffering that the war has taken on our scholars,” Brockett said. “Or on the thousands of Syrians who have moved to Kitchener-Waterloo as refugees in the past two-and-a-half years.” This is a challenge that I myself faced when interacting with Syrian newcomers through my class with Brockett last semester, yet I am unable to give an answer that can be applied to every individual. There is no right or wrong answer, but rather an understanding that we should be sensitive and thoughtful. Often it is the little things that we are able to do that can impact individuals on a personal level. Brockett concluded with a response from a Syrian newcomer in the K-W region who was invited to attend the symposium. Recent bombings in Damascus have left people in the suburb of Ghouta trapped in basements fearing for their lives, including the newcomer’s sister. “The idea of ‘how can I spend fun time while my sister may face death at the same time?’ The whole idea scares me.” She explained, declining the invitation to speak further. Although we are aware that we can do little to stop the conflict in Syria, we all can and do contribute in other ways. ISOW’s vice president reminded us that we are all humanitarians, as $4 of our tuition is donated to ISOW for them to fund their scholarship programs. ISOW have supported 13 undergraduate and graduate students from other countries on full scholarships programs in only two-and-a-half years. We quickly moved on to the workshop; we were given hypothetical situations that while fictional for us are the reality of many Syrians. In groups of 10 we formed a Syrian family, all with different opinions of how to respond to the conflict and we had to conclude as to whether to stay in Syria or flee to neighbouring counties. The workshop made us consider some of the realities that many Syrians face. An ill family member may make fleeing difficult, and children who are committed to their education in Syria may wish to stay. More than anything, it made us realise that there was no easy option, regardless of our decision, our family still faced hardship. Death of family members was often a consequence of either circumstance; there was no “better” solution. The morning ended with a lunch of Syrian cuisine prepared by Brockett’s wife Meg and her Syrian friends. A favourite class last semester meant that eating Syrian food was a regular occurrence for me and I had missed it greatly. The Syrian food was served to students in the dining hall, which was a great way to allow students to try new cuisines. While we were eating, a second ISOW scholar spoke. She used the word “privilege” a few times; the privilege of the scholarship to allow her to have an education, the privilege to play soccer, the privilege of being safe. These are things which many us take for granted, and it’s important to remember that for some people, these things are not guaranteed. Trying to find an answer to the question “how should we respond to the human realities of conflict?” is difficult; there is no black and white answer. While the symposium didn’t necessarily provide an answer, it did help us get a little closer. There is no right or wrong answer, but rather an understanding that we should be sensitive and thoughtful. Often it is the little things that we are able to do that can impact individuals on a personal level. On a bigger scale, ISOW is a direct response to the human realities of conflict and has had a life-changing impact on thirteen scholars. On top of this, it encourages thoughtful conversation and discussion around the topic, and a greater understanding of the realities that individuals may face.